As many Japanese releases, the Japanese release of A Secret History features bonus tracks: here only ‘Don’t Look Down’ without particular reason (but still a good choice!). Of course, the record comes with an obi strip. It is a blue obi strip with Japanese notes. On the back a small biography is to be found and a Japanese discography including the Sony/Tristar releases. The front of the obi strip also features the V2 logo in red with the catalogue number (‘V2CI 56’), and the price. On the side the English names of the band and the album are printed in yellow over a black background (like the bar on the original artwork), and at the bottom there is a white frame in which are printed a V2 logo and the catalogue number. The back of the obi also includes the release (?) dates, a CD Digital Audio logo and the mentions ‘V2 Records Japan Inc.’ and ‘Distributed by SME Intermedia Inc.’. The back cover features the full tracklisting including the bonus song ‘Don’t Look Down’. On the back are printed the bar code with the V2 catalogue number. The copyright about the compilation is still printed but the tracks details are gone and have been replaced by ‘Manufactured by Sony Music Entertainment (Japan) Inc. (yp)’ and a simple ‘All Rights Reserved’. On the right of the Setanta logo are printed Japanese notes, dates and logos (V2, CD Digital Audio). The booklet is very similar to the UK release’s booklet, except that pages are numbered and have the catalogue number ‘V2CI 56’ printed on them. Both Setanta and V2 logos are printed on the back with notes. Finally, the record itself takes up the same artwork. It also features V2, Setanta and CD Digital Audio logos. Tracks’ copyright notes has been replaced by a general warning. Once unfolded, the sheet that comes with the booklet is made up of 6 pages. The first one holds the complete tracklisting in English and Japanese, and an article in Japanese only. 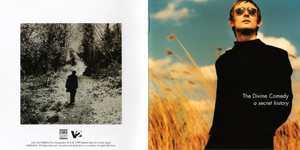 The other pages feature full lyrics, first in English, and then in Japanese. On the top of each page is printed ‘V2CI 56’ (not visible on scans). 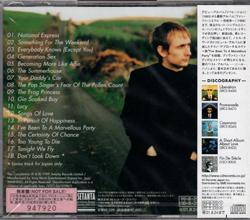 The Japanese releases of Divine Comedy’s albums also turned out in promo version. However, those promos are different than the European ones. It is an ordinary album, and not a CD-R or a CD in a card sleeve. It is indicated as being a promo with the mention ‘SAMPLE’ is graved on the CD slice. A sticker ‘Not for sale’ with the serial number on it is stuck on its back. It seems that each copy has a different serial number, but with the two first digits being always the same (94).